It’s finally here. The Dino Dana TV show will premiere in the US and UK on Amazon Prime video on May 26, 2017. The pre-schoolers TV series comes from J.J. Johnson, creator of the Dino Dan series. Amazon originally ordered it to series, back in November of 2015. 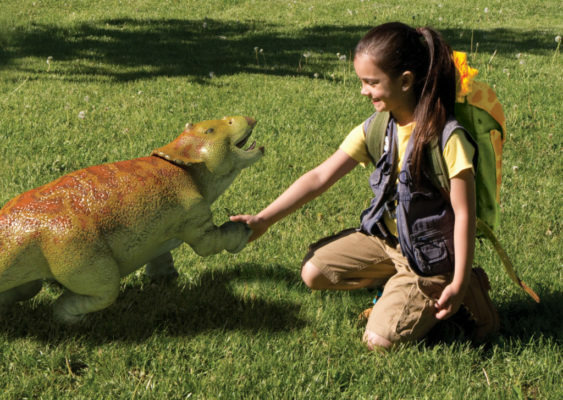 A live-action and CGI hybrid, Dino Dana is a sequel to Dino Dan: Trek’s Adventures. The new series features two sisters, with Michela Luci starring in the title role. The cast also includes Amish Patel and Saara Chaudry. Watch the Dino Dana TV series trailer. Check out this Amazon press release to learn more. SEATTLE–(BUSINESS WIRE)–May 2, 2017– (NASDAQ: AMZN)— Amazon today announced its brand-new Amazon Original Kids Series, Dino Dana, is scheduled to premiere on Friday, May 26 on Prime Video in the US and UK. A follow-up to the 2015 Emmy award-winning series Dino Dan: Trek’s Adventures, Dino Dana is a preschool program that takes viewers on a whole new level of dinosaur encounters. Combining live-action with CGI animation, the series features 11 new prehistoric creatures and, for the first time, two sisters. After a chance encounter with Trek and his Dino Field Guide, Dana (Michela Luci), a “paleontologist in training,” begins to see dinosaurs all around her, leading to plenty of action and adventure. Every episode shares interesting dinosaur facts and applies them to kid-relatable experiences. Created by J.J. Johnson (Dino Dan, Annedroids), the series is executive produced by Sinking Ship partners Johnson, Blair Powers and Christin Simms with animation executive produced by Matthew J.R. Bishop. Dino Dana will be part of Prime Video’s growing line-up of award-winning and critically-acclaimed Originals for kids and families which already includes Sinking Ship Entertainment’s Emmy-nominated series Annedroids and Bookaboo. Prime members will be able to stream the series using the Amazon Prime Video app for compatible TVs, connected devices, including Amazon Fire TV and mobile devices, or online at www.amazon.com/kidsoriginals, at no additional cost to their membership. Members can also download select titles to mobile devices for offline viewing. Dino Dana will also be available as part of Amazon FreeTime Unlimited, the all-you-can-eat subscription service designed from the ground up for kids. FreeTime Unlimited is available exclusively on Amazon devices, including Amazon Fire TV and Fire tablets, and a year-long subscription is included with every Fire Kids Edition. Eligible customers who are not already Prime members can sign up for a free trial at www.amazon.com/prime. For a list of all Amazon Video compatible devices, visit www.amazon.com/howtostream. What do you think? How do you like the sound of the Dino Dana TV show? Will your family check out the first season on Amazon Prime Video? More about: Amazon TV shows: canceled or renewed?, Dino Dana, Dino Dana: canceled or renewed? This show is just amazing. My 4 year old son has an extensive fino knowledge and we much prefer Dino Dana over Dino Dan. Great job, Amazon prime! my 4 yr old daughter LOVES this show .. its so great for her to see a female lead and a super smart and brave one at that… well done all.